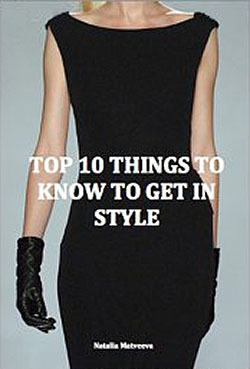 I got some many inquiries regarding what the top 10 things you should have in your wardrobe are, so I decided to include it in my monthly newsletter to make sure all of you, style lovers, keep it in check. Here is a checklist of the bare essentials. It’s not the last word, think of it as a skeleton. How you flesh it out depends entirely on your own style. Need some help with your wardrobe?? NEW YEAR – NEW YOU?!!! It’s such an important element of being comfortable in your own skin and feeling good about yourself. We all heard ‘you only get one chance to make a first impression’, whether it is an interview, meeting prospective client, presenting at a business meeting or meeting someone special in your life. And we also heard that if you look good, you feel good and more confident. So how do you feel better about yourself and discover the new YOU? If you really want to make changes, gain greater confidence, new stylish look, reveal your full potential and how fabulous you can look at any time we have a solution for you. Practical experience has found that the majority of our clients choose our popular Style Makeover package as it takes care of all key style elements to ensure nothing has been left out. As a GIFT from us, those who book and pre-pay for a makeover session by 30th of January will receive a complimentary ONE extra shopping hour. Consider this saving as an extra dress hanging in your wardrobe or a considerable step towards your next pair of Choos. PS: Feel free to forward this email to any of your contacts/friends who might benefit from Style-And-You services … they will only say THANK YOU for it. Need to refresh your style?? You can not underestimate the importance of a dress in every woman’s wardrobe. Personally I will always go for a dress before a skirt for the simple reason that you just put it on and you are done! No mucking around with what goes with it. For some it‘s always been too difficult to find the dress that best suits their body shape. Separates now form the backbone of most modern wardrobes. However it may just be worth taking another look at the practical benefits of one-piece dressing. The right dress can add height, broaden your shoulders, and skim your hips. You can vamp it up, play it down, or simply enjoy the pure feminine pleasure in a swish of fabric or a nipped-in waist. Dresses can be tricky because they have to fit well in so many different spots: shoulders, bust, waist, hips and length. Try lots of different designers and when you find one whose cut works for you, stick with it. In the fitting room, make sure you can sit down, cross your legs, bend over and reach up without pinching or squeezing (which will make you look bigger than you are) or exposing more than you want to. Add definition with a belt. Even if your dress is seamed at the waist, that may not be enough, plus accessories almost always make an outfit more interesting and stylish. A tailor can reasonably be expected to adjust hem length (up or down), strap length or waist width. However if more than one of these is required, you are probably buying the wrong size of style of dress. Pear-shaped figures will really benefit from the defining and smoothing effects of a sharp-shouldered, bias-cut style. A-lines are the best hip minimisers. A curvy figure looks best in fabrics that drape rather than cling. Never leave your waist undefined. A curvy figure will stop traffic in a wrap dress. An hourglass shape with a full skirt and nipped-in waist will give boyish figures some feminine flare. A tailored, waisted shift will subtly shape a boyish frame. Heavy arms can be disguised by slim (not tight) ¾ length sleeves. An all-over print keeps the eye moving and disguise a multitude of figure faults. Style-And-You offers a variety of styling services, from a wardrobe consultation, a day of personal shopping to the TOTAL style makeover, which oversees all elements of style to ensure your full transformation is complete. More over we like to see how our clients are doing and keep in touch with them, tracking their progress. So don’t think you are on your own as we are always here to help you!